IHBC’s new Marsh Awards celebrate retired members and new heritage learners: £500 & IHBC School places too! The IHBC’s President has launched a new awards programme, developed in partnership with the Marsh Awards, that celebrates two leading heritage sector support groups – retired IHBC members and successful learners – with presentations that will include £500 and the offer of a free place at the IHBC Annual School. For the Marsh Christian Trust, sponsors of the new awards, Founder and Chairman Brian Marsh OBE said: ‘We set up these Awards with the IHBC in order to recognise the outstanding contributions of individuals in sustaining and passing on vital skills in conservation through collaborative working, teaching and sharing best practice. Hopefully the Awards, in a small way, will help raise the profile of this important discipline and encourage more people to pass on their knowledge’. The IHBC’s Marsh Award for Community Contribution (Retired Member) is offered to celebrate the contribution of a retired IHBC member to the community (for example through involvement in building preservation trusts, neighbourhood planning, civic and local trusts with heritage interests). 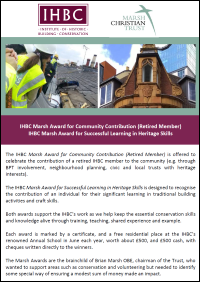 The IHBC’s Marsh Award for Successful Learning in Heritage Skills is designed to recognise the contribution of an individual for their significant learning in traditional building activities and craft skills. Both awards support the IHBC’s work as we help keep the essential conservation skills and knowledge alive through training, teaching, shared experience and example. Each award is marked by a certificate, and a free residential place at the IHBC’s renowned Annual School in June each year, worth about £500, as well as a £500 cash award. The Marsh Awards are the brainchild of Brian Marsh OBE, chairman of the Trust, who wanted to support areas such as conservation and volunteering but needed to identify some special way of ensuring a modest sum of money made an impact. The IHBC Marsh Award for Community Contribution (Retired Member) is open to any retired Full Member of the IHBC who has, since their retirement, worked on the historic environment for the good of a community. The IHBC Marsh Award for Successful Learning in Heritage Skills is open to anyone who has acquired new technical skills related to the appropriate care, maintenance or improvement of buildings and their context. Nomination is open to anyone.